Y'all just knew I wouldn't pass this up! Happy Sunset Shimmer Day! Hope ya feel the cool embrace of autumn wherever you are (or spring I suppose if you are on the south side). I love this time of year, especially because it's hot as Tartarus where I live so the cooler weather is a MUCH welcome breath of fresh air. I plead guilty though on already enjoying pumpkin recipes early. Been making/enjoying pumpkin cookies for a few weeks now. Well, I unfortunately don't have any writing to give you guys, but I found an artist that does some absolutely amazing Sunset art, so instead I'll just post some Sunset. So, a few notes for those who have this story in their bookshelves/tracking. I've had a few back-and-forth comment replies on the story musing about a potential sequel to this (by the way, if you don't want to be spoiled for the possible events in a sequel, don't read the comments). 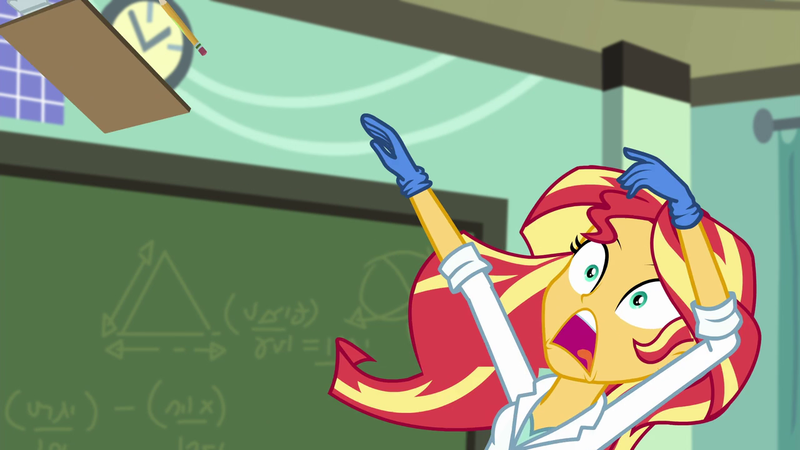 OK, so I had this idea for a Sunset Shimmer fic, but I'm so horrible at wrighting that I'd end up just butchering it. So I'm going to put my idea down below and anybody who wants to, can use it for their own fic, as long as they give me a link to it . Also, if you think my idea sounds familiar and now of a fic that already exists that uses it, give me a link to it please. Check out the next issue of Jem and the Holograms. Has Sunset Shimmer joined the series? Btw, she did make an appearance in an earlier issue. As a plushie. This is going to be a long one, because instead of just writing out a basic idea, I'm going to write out a short scene. Shout out to PresentPerfect and his hard work on those thoughtful reviews for the Sunset Shimmer Shipping Contest. I can't thank him enough for his high recommendation as my ego has five mouths to feed. As I said on my reply on his blog post this post will be a guide to 'the making of' Shimmer Run 1981 but first a little more of the "where have you been?" My new Sunset Shimmer fic is making excellent progress. I'm hoping to have the first chapter posted in a week or so. Fingers crossed. Any of you got any fic projects you're currently excited about? With how long I've been a Susnet Shimmer fan, figured I should finally do a short story. Hope to have it done in the next few days. I am currently hard at work on a group of stories that will eventually be available for public consumption. Two are done already, and I'll probably start on the third shortly. OK, so yesterday I was watching "Disney's A Christmas Carol", and then I suddenly thought "and people say a person can't change overnight". Then I remembered people Sunset's redemption at the end of the first movie, when it first came out, was unrealistic, or something. So now I want to see a story were, at the end of the first movie, the elements did an "A Christmas Carol" style redemption for Sunset. Sunset Shimmer travels the world and is introduced to the various cultures therein. I just think it would be interesting to see Sunset have to adapt to different cultures. Please link me to any fic with this concept. Just a quick piece of art I did to relax inbetween working on the new chapter of Evergreen Heart. Sunset as Kyoryuger Red. Yes I'm a big Sentai fan. I found this quite some time back, and I could never find it again.